This isn't just for Groovy files either,it's for any type of file I try to run a diff against. This is happening on systems running 10.9 and 10.8. The issue is that you are setting an app bundle in the config when the version control program is expecing a Unix command line. You should use /usr/bin/opendiff as the command line. I think that is the only chnage you need for the perforce diff you show. Example git configs for merging are in this question and several other duplicates on StackOverflow. Not the answer you're looking for? Browse other questions tagged xcode permission merge . Where can I download Filemerge - the app for comparing two tools and merging them? 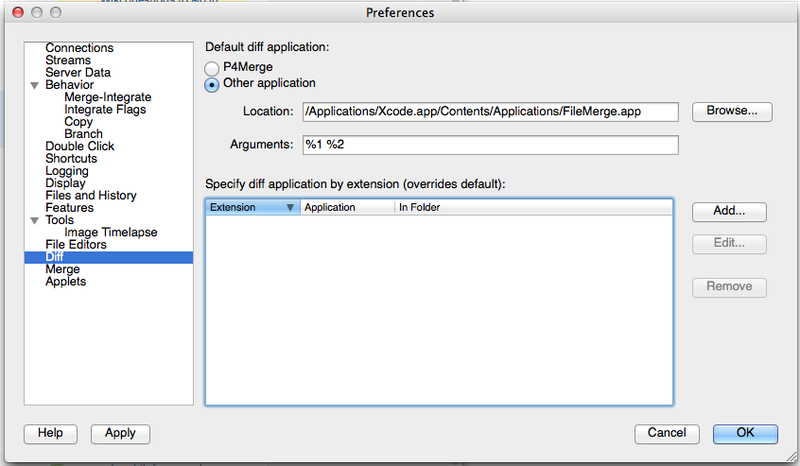 How can I transfer iJoomer app to XCode iPhone simulator? Is it possible to use FileMerge as standalone app? How can I test an iOS app with just a Macbook? How can I change a special app folder into an ordinary folder?